Remember my needlework carrots? One of them is embroidered baby booties. I started them, and this is what I’ve done so far. Some parts I’m happy about. Some, I’m not. First off, I decided to use flannel. 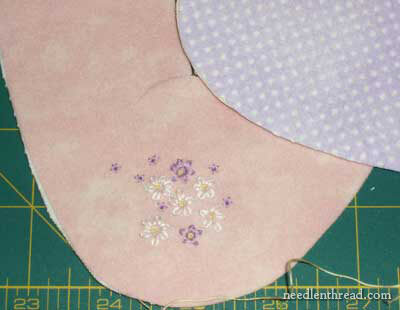 I had some scraps of pink flannel, and some scraps of a periwinkle-ish-purple with white polka dots. I decided that the polka dots would be the inside lining, and the polka dot sole would be on the outside, for the fun of the contrast. You can see the turn-down there on the cuff. I used mistyfuse to fuse both pieces of flannel together, and it worked really well. Still, they may be a bit stiff. I don’t know yet! I started with a lot of colors – but I narrowed it down to predominantly white and purple and green, with yellow French knots. I’m not drawing out any pattern – I’m just going to randomly cover the whole thing with white and purple flowers (mostly white, with a few purple and little tiny purple accents). I’ll be throwing in a few little green specks for leaves. Unfortunately, I didn’t have the right color of purple, and that’s kind of bugging me. 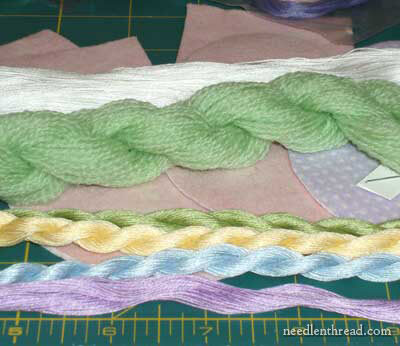 I went through every kind of thread in my stash (every kind) to find a matching color… but nary a match. So I went ahead with the purple I had. And. I. Don’t. Like. It. But – I keep telling myself it’s just a sample… it’s just a test! Unfortunately, I haven’t had a chance to get back to them for about 5 days now – and I have a nagging suspicion it’s because I don’t like the purple. I keep telling myself it’s because I haven’t had a chance, but deeeeeep down, I think I would have made a chance if I liked the purple! 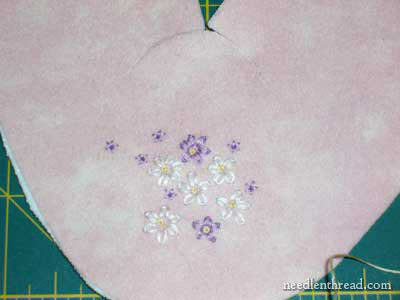 I’m going to machine-sew the soles on, then stitch over the seam. I’ll let you know how the finish goes on this! So there’s another carrot underway! Anyone ever make baby booties? How ’bout sharing some ideas or advice? December 5, 2009 Reader’s Embroidery: Beautiful Christening Gown Set! Mary: thanks for your blog. What is the thread in the foreground? I love its sheen…and do you have a pattern for these booties? I have several babies coming into my life soon. This is a lovely purple, but you are right that it doesn’t match. I suspect that would only bother other needle workers. That is a hard color to match. Good luck. They look lovely. Yep – a much bluer purple would be good. What sort of green? Light Leaf green? Those are great! I’d be interested to see the finished product. Mary, you must have ESP! I’ve saved details of a Butterick booties pattern I found with just this idea. My oldest daughter is expecting a little girl in February (our late Summer) who will need some warm booties by May/June and she will appreciate the fact that I hand embroidered them. My monitor shows your mauve thread as being a good match, so I’ll trust you when you say it’s not the right shade, LOL. Looking forward to seeing them completed. Relax! It’s cute! Just add a satin ribbon around ankle that matches the darker purple. 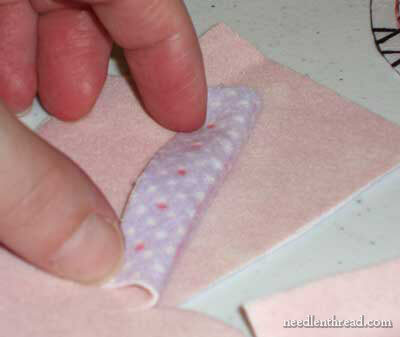 And trim with purple grosgrain as a welt around sole or as a reverse edge all around top cuff. And you can always add some pre-made satin flowers that are pale in color. Cluster three tiny ones together. This will make the darker shade look terrific. Remember, there are no mistakes – just happy accidents! Hi, all! Thanks for the comments and input! I happened to have to run into town yesterday afternoon and stopped at Michael’s to see if I could do a color match on that, with regular DMC – and I found the right color. For 33 cents, I figured what the heck? So I bought it, and I’m going to… uh … start over on the booties. Either that, or pick out the purple. I’ll probably just pick out the purple!! Next Next post: Great Tutorial for Smockers!